Dan Houston, Bernalillo County sheriff, revealed Tuesday that a 15-year-old teen accused of killing five family members was "involved heavily" in violent video games. A 15-year-old video-game fanatic accused of killing his parents and three younger siblings because he was mad at his mom will be tried as an adult, a New Mexico prosecutor announced Tuesday. "It was kind of what he was into and was quite excited as he got the opportunity to discuss that with investigators," Bernalillo County Sheriff Dan Houston said a news conference. Nehemiah Griego, 15, is accused of killing his parents and three siblings in New Mexico. The teen began planning the murders at least a week ago because he was upset with his mother, but his blood lust went beyond the family, police said. He contemplated shooting up a local Walmart and killing his 12-year-old girlfriend's parents, Houston said. The suspect sent the girl a photo of his dead mother after he shot her around 1 a.m and spent most of Saturday – between ambushing his father at 6 a.m. and going to his church at 8 p.m. -- with her, officials said. The unidentified girl has not been charged, but might be at some point, Houston said. 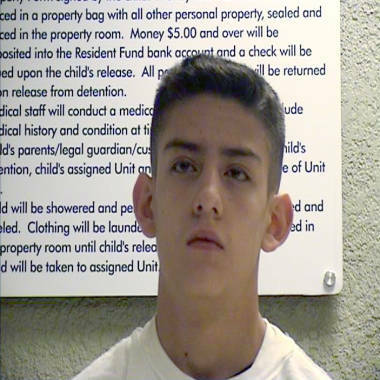 Griego was held without bail at a juvenile detention facility but will be tried as an adult on charges of first-degree murder and child abuse leading to death, Bernalillo District Attorney Kari Brandenburg said. The case will be presented to a grand jury within 10 days. Griego gave investigators the vaguest of explanations for his actions, officials said. "The motive as articulated was purely that he was frustrated with his mother," Houston said, explaining that the suspect refused to elaborate. "He was just frustrated with how things were." He said the teen was "very stern" as he walked investigators through the cold-blooded executions. He had four guns -- a .22 rifle with a 10-round ammunition holder, an AR-15 semiautomatic rifle and two 12-gauge shotguns -- some of which had been purchased by his father's friends and sold to the dad privately, police said. At 1 a.m., he allegedly killed his mother, Sarah, 40, while she slept. His 9-year-old brother, Zephania, was "awake and distraught" when he was slain soon after. A 2-year-old, Angelina, was sleeping when she was shot. A 5-year-old girl, Jael, was awake when she was killed. Then Griego lay in wait for his father, Greg, 51, a former jailhouse chaplain who was working the graveyard shift at a rescue mission. When he came home, his son killed him, too, the sheriff said. The father, a reformed gang member who used to run a halfway house for ex-cons on his property, had taught his son how to shoot, police said. Court documents say that the teen envisioned dying in a firefight with law enforcement after the killings. Instead, he spent the rest of the day with his girlfriend before he went to Calvary Church, where his father had once been pastor, and told people his family was dead, Houston said. A church security guard was driving the teen back to his house when he apparently had misgivings and called police, who went to the house and found the horrific scene. Police said they do not believe Griego had drugs or alcohol in his system, and there is no indication he was ever treated for mental illness. "This is beyond any human reasoning or understanding at this time," Houston said.